Is it black as your hat or a dark grey colour, I take it it tastes the same as white garlic. Is it GM? P.
It's as black as your hat and tastes more like a slightly spicy fig with the texture of plasticine. It's made by slow cooking bulbs of garlic at low temperatures for 3 or 4 weeks (give or take). The 'garlic' flavour is very mild. Nice spread on buttered toast, or used in a salad dressing or just on it's own. I've just ordered some from Amazon, it's a new one on me but I love garlic and I'm sure I will love this. To think it was only shaving products you could be enabled to buy on TSR! P.
Food enabling is just a TSR sideline. You won't be disappointed, I hope. The ones in tubs pre-peeled tend to have a more solid texture than the still in the bulb ones. The flavour/amount of sugar of the original bulb will affect the flavour of the end result. I'm sure I won't be disappointed, I'm pleased you mentioned it, I had never come across them before and I do like to try unusual food stuffs, so thank you. Paul. 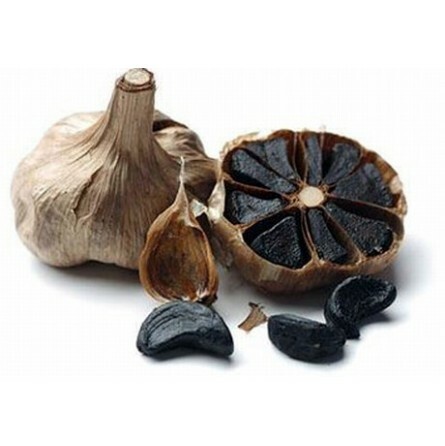 Black garlic.......very enjoyable, had with eggs on toast, just the job. Look like little black slugs but taste good. Thanks again for the heads up P.